We definitely have our favorites. Sweet Basil was our first stop for dinner. Terra Bistro serves fitness-conscious dishes and boasts multiple accolades from publications like Gourmet Magazine and the New York Times. 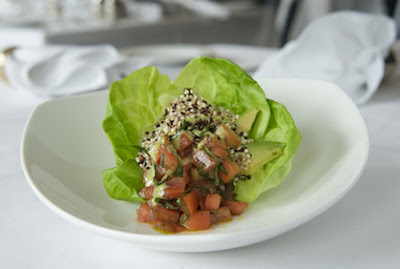 Butterhead lettuce with avocado, balsamic macerated tomatoes, basil aioli, and quinoa... delicious! A new restaurant, Matsuhisa, was a real treat. Robert DeNiro was a regular visitor at Matsuhisa in Beverly Hills and travelled there often for the dining experience. He reportedly begged Nobu Matshisa to open a restaurant in New York. After years of begging, DeNiro convinced Matsuhisa, and together they opened Nobu in 1993 in Tribeca. Today, there are Nobu restaurants all over the world. However in Vail, rather than open another Nobu, Matsuhisa is more closely compared to the Beverly Hills original. (Along with Aspen, Athens, and Mykonos) The Matsuhisa Restaurants are privately owned by the Matsuhisa family, while the Nobu Restaurants are co-owned by Nobu, Robert De Niro and friends. They both sound great, and I learned a little on Nobu and the family. As I have posted before we have been to Vail in the winter, but never in the warmer seasons. I think its time for a change. Gee thanks...I am craving a full on four course meal at 7am! Everything looks DEVINE!! Beautiful food! Love your travel blogging. Heading to NY today, love that restaurant review site you recommended. Not sure how many we will get to on this trip as tennis is on the schedule, we will be grabbing a bite in Flushing Meadow most nights. We used to always eat at Nobu when we lived in NYC and I miss it. This post is not making the bowl of cheerios I'm eating look very good! We were just there as well - Have you tried Kelly Liken? The best! We also ate at Beano's in Beaver Creek... DIVINE!! We were just there as well! We loved our dinner at Kelly Liken - and also ate at Beano's in Beaver Creek - have you been? DIVINE!! Gorgeous photos. Thanks for transporting me to that crisp, clean air again!